We are Peter van Deursen & Anneke Koremans. Before we set up our French company, Barinca Travel & Tourism, we were already very active in the world of tourism. 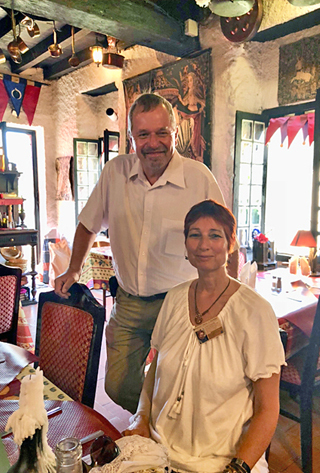 Peter was a tour guide, travelling through Europe for a big Dutch tour operator for over 18 years, and Anneke was a travel agent and writer of travel booklets. She celebrated her 25th anniversary of being a licenced travel agent in 2018. In 1998 we fell in love with Cathar Country; with the enigma of Rennes-le-Chateau, the story of the Cathars, the many castles and forts, the Pyrenees, the ancient abbeys, the medieval villages, the food and the people. The love that we feel for this area comes from the love we have for history, nature and culture. After having visited many countries, we realised that this particular part of France is like Europe in miniature; a mix of interesting cultures and a variety of breathtakingly beautiful landscapes. After buying a small summer house in the Montagne Noire - north of Carcassonne - in the year 2000, we decided to try to move to France within 10 years. In June 2007 we emigrated from Holland to Belvianes et Cavirac, France and founded Barinca Travel & Tourism in 2008. Completely in love with Occitania, we started to assist both individuals and groups in organizing their visit to this region. In 2018, Barinca Travel & Tourism celebrated its 10 year anniversary, and continues to facilitate from the heart beautiful tours in this magnificent area, co-operating with local tourist offices, hotels, restaurants and sites. The passion we feel to protect the Occitan culture is founded on the forgotten history of this area. Occitania is one of the richest cultural heritages of Europe, but is hardly ever mentioned in the history books. We would be very happy to tell you all about this amazing Land of Oc and its incredible history and secrets, and help you organise an unforgettable, custom made holiday or group tour. In 2018 we decided to expand and include Greece in our services. Therefore we will be offering customized tours for groups from 2019 onwards; custum made tours to suit your wishes, tours that will be unique, as through Barinca Travel & Tourism you will discover Greece in a different way. Greece is more than just a lovely holiday destination in Europe; it is an important historical area where Hermetic Teachings and Gnostic Teachings were taught and discussed, and where the ancient Philosophers created their monumental legacy to the world. Anneke will be your guide and tour manager in Greece - working together with an experienced Greek travel agent - aiming to help bring the antique world, the Hermetic Teachings and the ancient realm of Gaia back to life.